Not to be confused with Lockheed L-133 Starjet. For other uses, see Jet Star (disambiguation). The Lockheed JetStar (company designations L-329 and L-1329; designated C-140 in US military service) is a business jet produced from the early 1960s to the 1970s. The JetStar was the first dedicated business jet to enter service. It was also one of the largest aircraft in the class for many years, seating ten plus two crew. It is distinguishable from other small jets by its four engines, mounted on the rear of the fuselage, and the "slipper"-style fuel tanks fixed to the wings. The JetStar originated as a private project within Lockheed, with an eye to winning a United States Air Force (USAF) requirement that was later dropped due to budget cuts. Lockheed decided to continue the project on its own for the business market. The first two prototypes were equipped with two Bristol Siddeley Orpheus engines, the first of these flying on 4 September 1957. The second of these was also equipped with the wing-mounted "slipper tanks", which was originally to be an option. Lockheed attempted to arrange a contract to produce the Orpheus in the US, but when these negotiations failed it re-engined the second prototype with four Pratt & Whitney JT12s in 1959. The slipper tanks were removed and placed on the first prototype. The JT12 fit proved successful and was selected for the production versions, the first of which flew in mid 1960. These versions entered commercial service in 1961. Noise regulations in the United States and high fuel consumption led to the development of the 731 JetStar, a modification program which added new Garrett TFE731 turbofan engines with a number of detail changes. It has redesigned larger external fuel tanks that sit with their upper surfaces flush with the wing, rather than being centered on it. The cockpit area has a somewhat more "modern" looking nose and window arrangement. The 731 JetStar modification program was so successful that Lockheed produced 40 new JetStars, designated the JetStar II, from 1976 to 1979. The JetStar IIs were factory-new aircraft with the turbofan engines and revised external fuel tanks. Both 731 JetStars and JetStar IIs have greatly increased range, reduced noise, and better runway performance compared to the original JetStars. JetStar production totaled 204 aircraft by final delivery in 1978. Most original JetStars have been retired, but many 731 JetStars and JetStar IIs are still flying in various roles, mainly as corporate and private jets. The JetStar has a fairly typical business jet design layout, with a swept wing and a cruciform tail. The wing has a 30° sweepback and features large fuel tanks at about half-span, extending some distance in front and behind the wing. The wings hold 10,000 pounds of fuel, and each slipper tank holds 4,000 pounds of fuel for a total fuel load of 18,000 pounds. The wing also includes leading edge flaps (not slats) along the front of the wing outboard of the tanks (these leading edge flaps reduce the stalling speed by an additional three knots), while double-slotted trailing edge flaps span the entire rear surface inboard of the ailerons. The wing incorporates inflatable rubber deicing boots for the removal of accumulated inflight ice. The horizontal stabilizer is mounted nearly halfway up the fin to keep it clear of the engines' jet blast. One feature is that the horizontal stabilizer is trimmable by pivoting the entire tail fin and stabilizer assembly, which has a distinctive unpainted area at the base of the fin that is noticeable in most pictures. The JetStar does not have any tail deicing capability, nor was it required for certification. A speed brake is located on the underside of the fuselage to aid deceleration for landing. The original prototypes used a tricycle landing gear with one wheel per leg, but after an accident in 1962 the nose gear was modified with two tires. The JetStar is a relatively heavy aircraft for its class, at 44,500 lb (19,278 kg). Maximum cruising speed is Mach 0.8, or 567 mph (912 km/h) at 21,000 ft (6,401 m). Range is typically quoted as 2,500 mi (4,023 km) with a 3,500 lb (1,588 kg) payload. Typically, interiors feature seating for eight with a full-sized lavatory, or a slightly denser arrangement for ten. The JetStar is one of the few aircraft of its class which allow a person to walk upright in the cabin, although to do this the aisle is sunk slightly so that the seats are raised on either side. The windows are relatively large. An additional eleven airframes were designated C-140B, although the first of these predated the C-140As when it was delivered in 1961. The C-140Bs were used to transport personnel by the Military Airlift Command. Six of the aircraft were operated as VIP transports by the 89th Military Airlift Wing at Andrews Air Force Base. These VIP aircraft were designated as VC-140Bs. Members of the VIP transport fleet occasionally served as Air Force One during the 1970s and 1980s. Several other countries, such as Germany and Canada, have used military JetStars as transports for their heads of state, heads of government, and other VIPs. Business, executive transport aircraft, with accommodation for a crew of two and ten passengers, powered by four 3,300 lbf (14.7 kN) thrust Pratt & Whitney JT12A-8 turbojet engines. New production version, powered by four 3,700 lbf (16.5 kN) thrust Garrett TFE731-3 turbofan engines, and fitted with revised external fuel tanks, 40 built. Modified version, fitted with four Garrett TFE731-1 turbofan engines, and equipped with redesigned external fuel tanks. Flight inspection aircraft for the US Air Force, similar to the JetStar I, five built. Passenger, cargo transport aircraft for the US Air Force, similar to the C-140A, five built. VIP transport aircraft for the US Air Force, similar to the C-140B, six built. Two JetStar 6s were ordered by the United States Navy, originally designated UV-1, but not delivered. US military designation for a proposed trainer version of the C-140 for evaluation, not built. Conversion by American Aviation Industries with two General Electric CF34 engines in place of the four JT12 turbojets or TFE731 turbofans which first flew on 5 September 1986. Only one aircraft was converted. C-FDTF Jetstar 6 – The Atlantic Canada Aviation Museum has a Jetstar that was used by the Canadian Prime Minister and other government officials. C-FDTX Jetstar 6 – The Canada Aviation and Space Museum in Ottawa, has an L-1329 Jetstar 6 that the Department of Transport used to carry government officials and foreign dignitaries. N175MD Jetstar II – The Miami Auto Museum in North Miami, Florida has a complete JetStar on display inside the museum. N329J – The prototype JetStar is undergoing restoration at the Museum of Flight's Restoration Center in Everett, Washington. This aircraft is one of only two JetStars with only two engines. N711Z Jetstar - On pylon display in false USAF marking as 89-001 near Base Operations and the AMC Air Terminal at Andrews AFB, Maryland. N777EP - A JetStar owned by Elvis Presley in his later years, named Hound Dog II, is on display at Graceland, Memphis Tennessee. This is one of two Jetstars owned by Elvis Presley and/or his family. 61-2400 – The Museum of Aviation next to Robins Air Force Base has a VC-140B on display. XB-DUH Jetstar 8 - At the entrance to Dodson International Parts in Rantoul, Kansas in false Mexican markings. 59-5959 C-140A - In the Scott Field Heritage Air Park at Scott AFB, Illinois (59-5959). 61-2489 C-140B – Pima Air and Space Museum, adjacent to Davis-Monthan AFB in Tucson, Arizona. 61-2490 VC-140B - President Lyndon Johnson's JetStar is on display at the Lyndon B. Johnson National Historical Park. 61-2492 VC-140B - In the Presidential Aircraft collection of the National Museum of the United States Air Force, Wright-Patterson AFB, Ohio. 62-4201 C-140B - Hill Aerospace Museum, Hill Air Force Base, Ogden, Utah, this was confirmed by former members of the 89th SAM from Andrews Air Force Base to have carried President Johnson and his wife. ^ a b Murdo Morrison (12 Oct 2018). "NBAA: Business jet designs that changed the industry". FlightGlobal. ^ "Airliner price index". Flight International. 10 August 1972. p. 183. ^ "The Lockheed JetStar". Airliners.net. Demand Media, Inc. Retrieved 16 January 2016. ^ a b Bogash, Robert A. "Jetstar History". Welcome to Trains, Planes, and...... Robert A. Bogash. Retrieved 16 January 2016. ^ Loftin, Laurence K. "Representative Aircraft Types". NASA. Retrieved 16 January 2016. ^ "Iraqi Airways Lockheed L-1329 JetStar II YI-AKD / MUC". aircraftslides.blogspot.com. 26 March 2015. Retrieved 28 May 2017. ^ "Iraqi Airways Lockheed Jetstar YI-AKB (1981)". aviationphotocompany.com. 1981. Retrieved 28 May 2017. ^ "Accident description". aviation-safety.net. 27 May 2017. Retrieved 28 May 2017. ^ "Eastern Airlines Lockheed L-1329 JetStar 8 N12241 (msn 5141) LBG (Jacques Guillem Collection). Image: 907634". airlinersgallery.smugmug.com. Retrieved 28 May 2017. 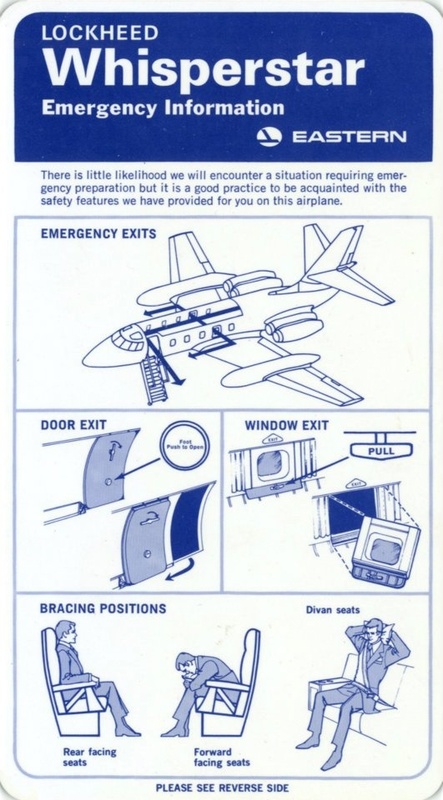 ^ "Eastern Lockheed Whisperstar Emergency Information". pinimg.com. Retrieved 28 May 2017. ^ "1971 – Eastern Airlines Aero Commander 500B N6291X and Lockheed JetStar 6 N12241 "WhisperStar" at Miami". pbase.com. 1971. Retrieved 28 May 2017. ^ "Lockheed Jetstar". Atlantic Canada Aviation Museum. Atlantic Canada Aviation Museum. Retrieved 22 January 2016. ^ "LOCKHEED L-1329 JETSTAR 6". Canada Aviation and Space Museum. Canada Science and Technology Museums Corporation. Retrieved 16 January 2016. ^ Perry, Kev. "USA April 2013 'The Airshows That Never Were' Tour Part 1". DTVMovements. DTVMovements. Retrieved 22 January 2016. ^ "The Jetstar Thread". FlightAware. FlightAware. Archived from the original on 26 January 2016. Retrieved 22 January 2016. ^ "Lockheed Jetstar CL-329 Prototype". The Museum of Flight. The Museum of Flight. Retrieved 21 January 2016. ^ "Airframe Dossier – Lockheed VC-140B-LM Jetstar, c/n 1329-1002, c/r N711Z". Aerial Visuals. AerialVisuals.ca. Retrieved 22 January 2016. ^ "Elvis Presley's private jet up for sale". CNN. CNN. Retrieved 25 June 2018. ^ "Lockheed C-140B "Jetstar"". Museum of Aviation. Archived from the original on 18 December 2015. Retrieved 16 January 2016. ^ "Airframe Dossier – Lockheed Jetstar 6, c/n 5157, c/r XB-DUH". Aerial Visuals. AerialVisuals.ca. Retrieved 22 January 2016. ^ "C-140 JETSTAR". Scott Field Heritage Air Park. Scott Field Heritage Air Park. Retrieved 22 January 2016. ^ "Airframe Dossier - Lockheed C-140A-LM Jetstar, s/n 59-5959 USAF, c/n 1329-5026". Aerial Visuals. AerialVisuals.ca. Retrieved 22 January 2016. ^ "JETSTAR". Pima Air & Space Museum. PimaAir.org. Retrieved 16 January 2016. ^ "Airframe Dossier - Lockheed C-140B-LM Jetstar, s/n 61-2490 USAF, c/n 5024". Aerial Visuals. AerialVisuals.ca. Retrieved 16 January 2016. ^ Gamino, Denise (Aug 19, 2010). "Piece of flying history lands on LBJ ranch". Statesman. Retrieved 16 January 2016. ^ "Lockheed VC-140B JetStar". National Museum of the US Air Force. October 1, 2015. Retrieved 16 January 2016. ^ "Airframe Dossier - Lockheed VC-140B-LM Jetstar, s/n 61-2492 USAF, c/n 1329-5031". Aerial Visuals. AerialVisuals.ca. Retrieved 16 January 2016. ^ "C-140B "JETSTAR"". Hill Air Force Base. September 27, 2007. Archived from the original on 27 January 2016. Retrieved 16 January 2016. ^ Francillon 1982, p. 394.